Small plant plays a pivotal role in the maintenance and upgrading of infrastructure on the rail network, and a few simple steps can ensure that safety and productivity remains on the right tracks. When you buy a car, you know that the purchase price is just the start of an ongoing sequence of regular payments for the privilege of ownership including tax, fuel, maintenance and repair. These are all to keep the vehicle safe and operational for years to come. Many other purchases, no matter what the initial cost, also commit the owner to ongoing financial expenditure – and tools are no exception. 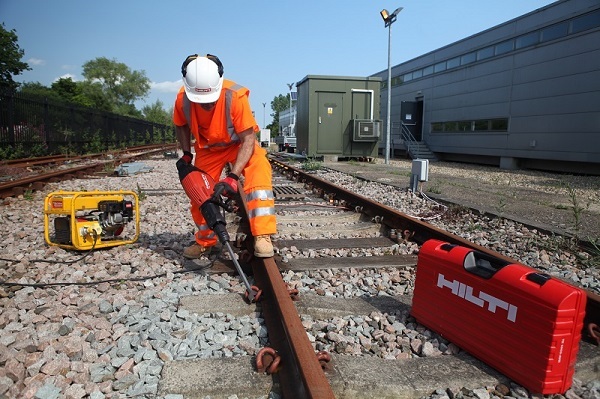 The rail industry is known to invest in good equipment to ensure worker safety and maximise productivity against tight timescales. That said, there are areas that can still be improved if businesses want to avoid work hitting the buffers. Power tool lifetimes vary from one to five years depending on the type of tool, frequency of use and the application. Out in the field, tools tend to either be replaced when they break down, or they remain as part of the inventory and keep getting repaired because they are believed to still do the job intended. But is this really the most cost-and capital-effective way to manage a fleet of power tools? Replacing tools every time they break down is a false economy – driven by selection of cheaper tools that don’t last – and the fact that reactive repairs and spare parts, when charged separately, are costly and time consuming to manage. So, when it comes to discussing the issues associated with tool productivity and the costs of keeping a tool fleet at peak performance, one word stands out above many others – maintenance. Tool operators know that when they collect their tools first thing in the morning – or the evening for those working nights – that a number of immediate checks can help ensure a full shift’s work. Check the chuck is free of dust and greased. A small amount of grease can be applied if necessary. Check vents are clear and free of debris. Check that grip points are clean and in good condition. Check that the trigger mechanism and lock – if applicable –works correctly. If it’s a corded tool, check the length and condition of the cable and plug. If it’s a cordless tool, check the correct battery is being used, the connection points are clean and undamaged and the battery is fully charged and fitted correctly. At the end of the day, the tool should be visually inspected again, wiped down and cleaned to ensure it is ready for use next time. Any issues should be reported immediately so the tool can be sent off for service or repair, knowing that a replacement can be sourced to minimise downtime. There are of course many other areas of small plant ownership that have to be considered – health and safety, battery technology and fleet optimisation to name but a few – but maintenance goes a long way to start down a safer and more profitable path. We strongly believe addressing this issue will help to make the sector more profitable – making it a more sustainable business, securing and creating more jobs and generally improving the rail industry.